We are delighted to announce the publication of our newest calendar in EMLO, that of the 1,669 letters of Joseph Justus Scaliger (1540 – 1609). In 2012, the eight-volumed edition of The Correspondence of Joseph Justus Scaliger (1540–1609) published by the esteemed Librairie Droz, Geneva, under the direction of Max Engammare, was launched in style at the Divinity School of Oxford’s Bodleian Library at a reception hosted by Cultures of Knowledge. We are delighted now, through our continued collaboration with the Librairie Droz, to be able to make available within EMLO the metadata for this extensive correspondence. This entry was posted in Podcasts & Videos, Project Updates, Publications on February 20, 2015 by Miranda Lewis. It gives us huge pleasure to announce the re-launch of Early Modern Letters Online – EMLO – our union catalogue of sixteenth-, seventeenth-, and eighteenth- century letters, comprising of a complete aesthetic makeover for the website and the release of nine new collections focused on significant figures of the republic of letters. This entry was posted in Project Updates, Projects & Centres, Publications, Uncategorized, Websites, Databases, Apps, & Code on January 16, 2015 by Miranda Lewis. Kaspar Schotts Netzwerk: publication announcement and project profile. Caspar Schott S.J. (1608-1666) is a remarkable representative of the passion for scientific knowledge that, in the first two thirds of the seventeenth century, possessed enough educated people across Europe as to create a new social entity – the Republic of Letters – the service of which became their primary loyalty. They did not know exactly where they were headed, nor did they particularly foresee the magnitude of their impact; what they did know with blazing conviction was that the long tradition of philosophical theorising without the support of quantitative experiment was bankrupt. As Schott’s mentor and hero Athanasius Kircher says: ‘All philosophy unless grounded in experiment is empty fallacious and useless…Experiment alone is the arbiter of disputed questions, the reconciler of difficulties and the one teacher of the truth’1. This common conviction bonded scholars of disparate religious and philosophical outlooks to the citizenship of a republic of learning. This entry was posted in Letters in Focus, Project Updates, Publications on April 17, 2014 by Miranda Lewis. We are thrilled to announce the publication of a new volume of Jan Amos Comenius‘ Opera Omnia, by our esteemed colleagues in the Institute of Philosophy at the Czech Academy of Sciences, partners in our ongoing project around the correspondence and networks of Comenius. This entry was posted in Project Updates, Projects & Centres, Publications on January 16, 2014 by Miranda Lewis. We are excited to report that Dr Jackie Stedall and Dr Philip Beeley, the latter a former Research Fellow on Cultures of Knowledge (where he worked on the letters of mathematician John Wallis), have been awarded a major AHRC grant for a new early modern correspondence project on ‘Mathematical Culture in Restoration England: The Life and Letters of John Collins’. This entry was posted in Project Updates, Projects & Centres, Publications on September 12, 2013 by James Brown. 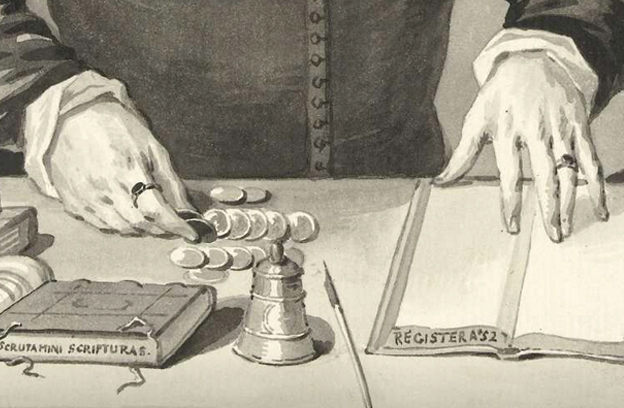 Our great friends and colleagues at Circulation of Knowledge and Learned Practices in the Seventeenth-Century Dutch Republic (CKCC), based at Huygens ING, have just launched their virtual research environment for Dutch scientific correspondences, the wonderful ePistolarium. 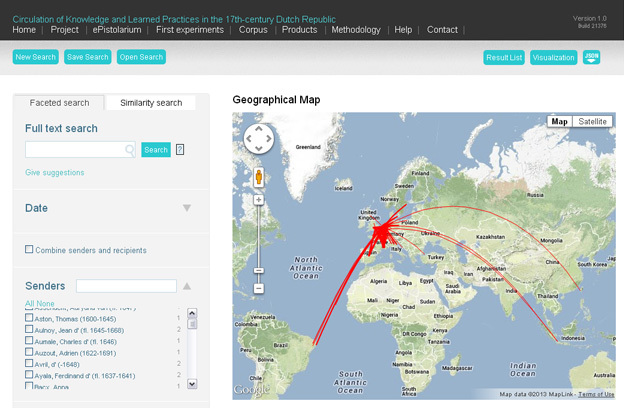 This major new resource contains metadata on and full texts of around 20,000 letters sent to and from nine seventeenth-century scholars (including René Descartes, Constantijn and Christiaan Huygens, and Antoni van Leeuwenhoek), and is equipped with faceted search, a neat visualization suite (results can be displayed on timelines, maps, and as both correspondent and co-citation network diagrams), as well as some bleeding edge techniques in corpus linguistics such as named entity recognition and topic modelling. Check it out! The ePistolarium was launched in the magnificent Gertrudiskapel in Utrecht on 13 June 2013, and, alongside presentations from its creators (and a terrific video), our very own Howard Hotson was on hand to celebrate this new tool and to consider its relationship to Early Modern Letters Online as well as its significance to scholarship on correspondences more broadly (a video of his talk, entitled ‘The ePistolarium and the Digital Republic of Letters: The Circulation of Knowledge and Learned Practices in the Twenty-First Century’, is above). Indeed, these are exciting times for the Digital Republic of Letters in general and the relationship between our two initiatives in particular; we’re going to share metadata, are co-applicants with other interested parties on major funding proposals to COST and Digging into Data, and will be sharing the stage at several forthcoming events, most imminently (with Antony McKenna) at our panel on ‘Electrifying the Republic of Letters’ at Intellectual Networks in the Long Seventeenth Century at Durham next week. Congratulations to Charles, Guido, Walter, Wijnand, and the rest of the CKCC team! This entry was posted in Events, Podcasts & Videos, Projects & Centres, Publications, Websites, Databases, Apps, & Code on June 28, 2013 by James Brown. Open-Sourcing EMLO-Edit: Code for our Editorial Interface Now Available on GitHub! We are pleased to report that the complete code base of EMLO-Edit, the editorial interface for all of the metadata underlying Early Modern Letters Online, is now freely available for reuse on GitHub. Built from scratch by our Founding Developer Sue Burgess from Bodleian Digital Library Systems and Services (BDLSS), EMLO-Edit is a powerful, user-friendly editorial environment for describing, tagging, and managing letter records, including facilities for uploading images, dealing with people and places, merging duplicate records and metadata, user management, full version histories, and exports. The resulting data provides an ideal basis for front end applications in a variety of languages (we’ve used Python/Pylons but you could also develop, say, a Rails application). The code is ready for deployment, and includes full installation instructions for setting up a working version on your own servers; we will be adding a bit more documentation on how to customize the code for your own purposes, but in the meantime grab it while it’s hot, and let us know if you make use of it! This entry was posted in Project Updates, Publications, Websites, Databases, Apps, & Code on June 17, 2013 by James Brown. Richard (third left) presents a copy of the edition to the Irish President (second left) at at a reception at Aras an Uachtarain earlier this week. We are excited to announce the publication by the Royal Irish Academy of Roderick O’Flaherty’s Letters to William Molyneux, Edward Lhwyd, and Samuel Molyneux: 1696-1709, edited by Professor of Diplomatic at Oxford (and CofK Steering Committee member) Richard Sharpe. 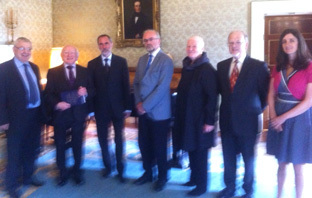 A copy of the edition was presented to Michael D. Higgins, President of Ireland, earlier this week. This entry was posted in Events, Project Updates, Publications on June 14, 2013 by Emma Curran. 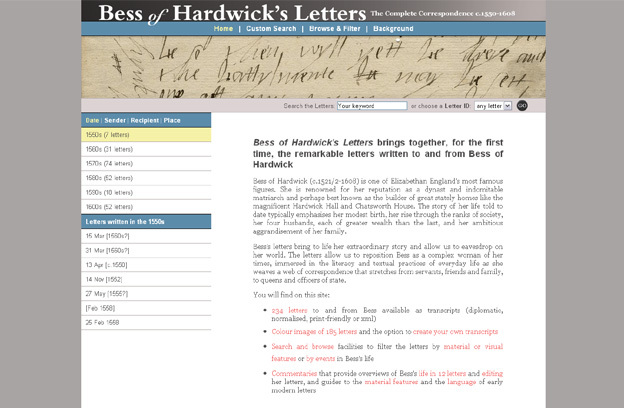 Bess of Hardwick’s Letters: The Complete Correspondence c.1550-1608 has recently gone online. Created by the AHRC Letters of Bess of Hardwick Project, led by Dr Alison Wiggins (University of Glasgow), this wonderful new digital edition makes freely available full texts of all 234 letters to and from Bess – one of Elizabethan England’s most famous figures – alongside colour images of 185 missives (with transcription facilities), contextualised by extensive commentaries on Bess and on the material and linguistic characteristics of early modern English correspondence that are alone worth the price of admission. Alison discusses the creation of this extraordinary resource in this super talk from our 2012 seminar series. Congratulations, Alison and team! This entry was posted in Podcasts & Videos, Projects & Centres, Publications, Websites, Databases, Apps, & Code on May 21, 2013 by James Brown.